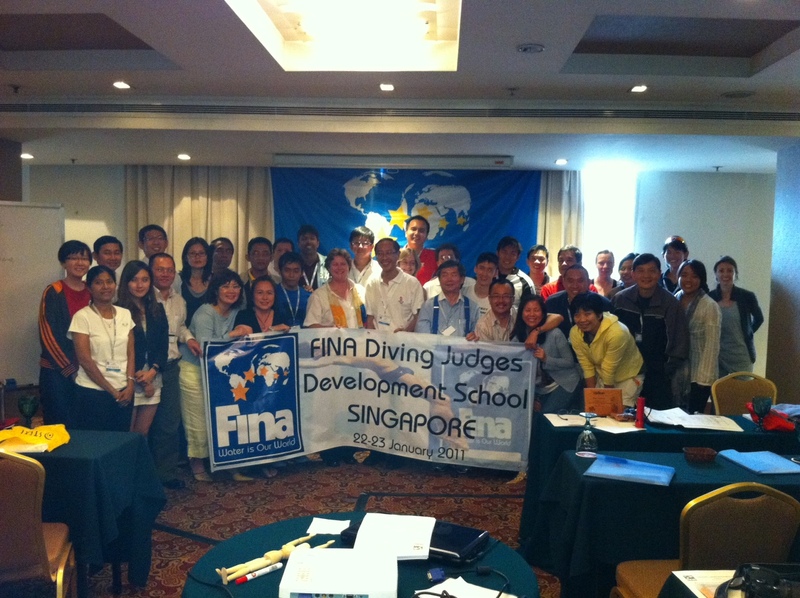 The FINA Diving Judges Development School was held in Singapore on the 22nd and 23rd of January 2011. There were a total of 23 local participants and 7 foreign participants from Vietnam, Thailand, Indonesia and Qatar. The school was conducted by a lecturer, Ann Sissons, from New Zealand, who is a member of the FINA Technical Diving Committee. This event serves to enlarge the pool of quality judges in the sport, ensuring that there is a uniform pattern of interpretation and application of diving rules from the judges. 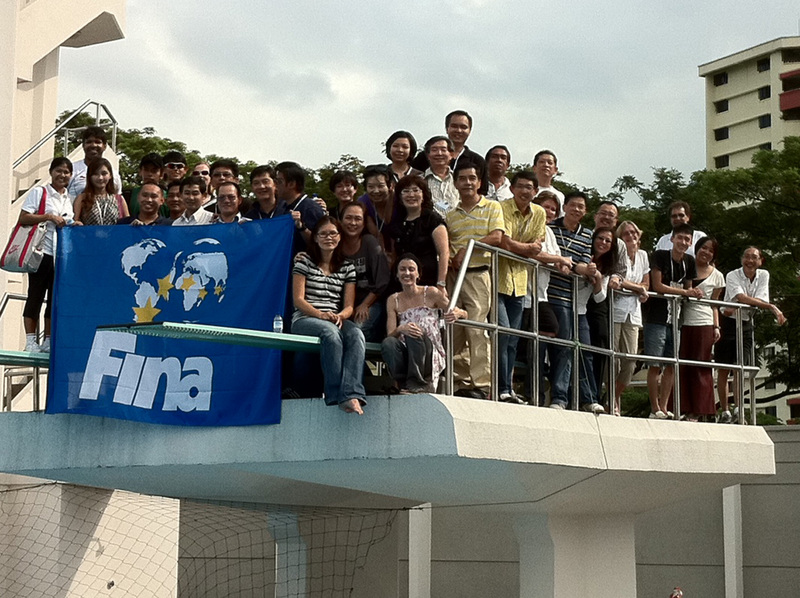 The course is also used as a tool to develop and promote diving worldwide. 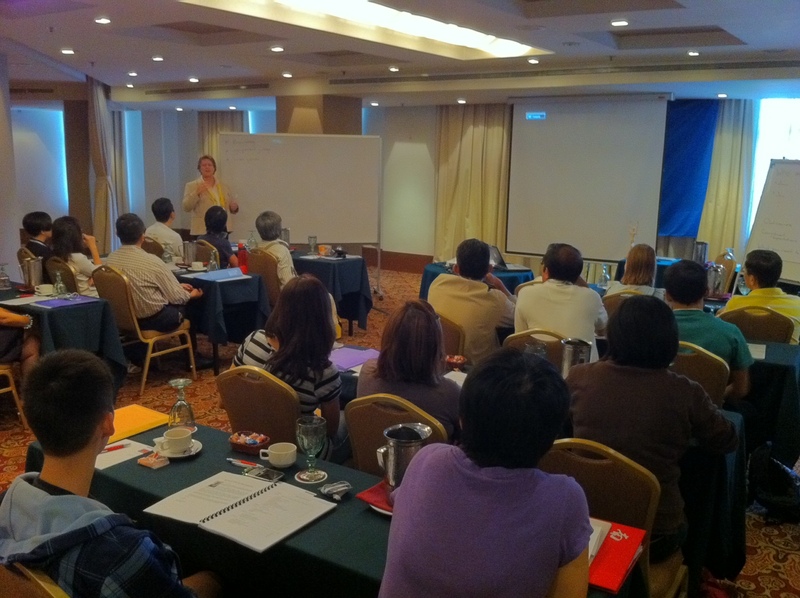 The school started on the 22nd of January, Saturday, at Rendezvous Hotel Singapore. 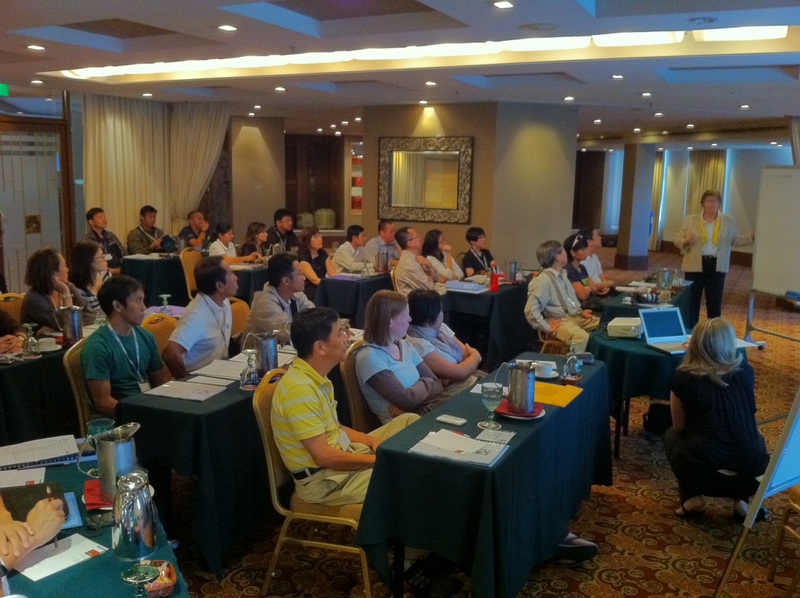 The participants had the luxury of an air-conditioned conference room for the course. Ann kicked start the day by going through some basics, including judge’s responsibilities, competition format and diving number designations. After which the group had their lunch break at the hotel’s Straits Café, before heading down to Toa Payoh Swimming Complex for a hands on session. 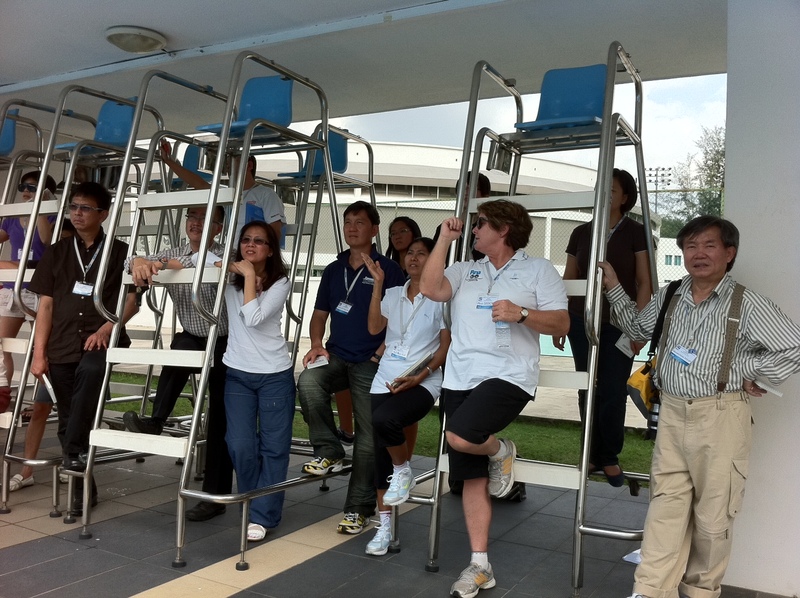 At the pool, the participants were able to observe the on-going ‘learn-to-dive’ training session, while Ann and her assistant, Sue Lewis, conducted lessons in two groups. 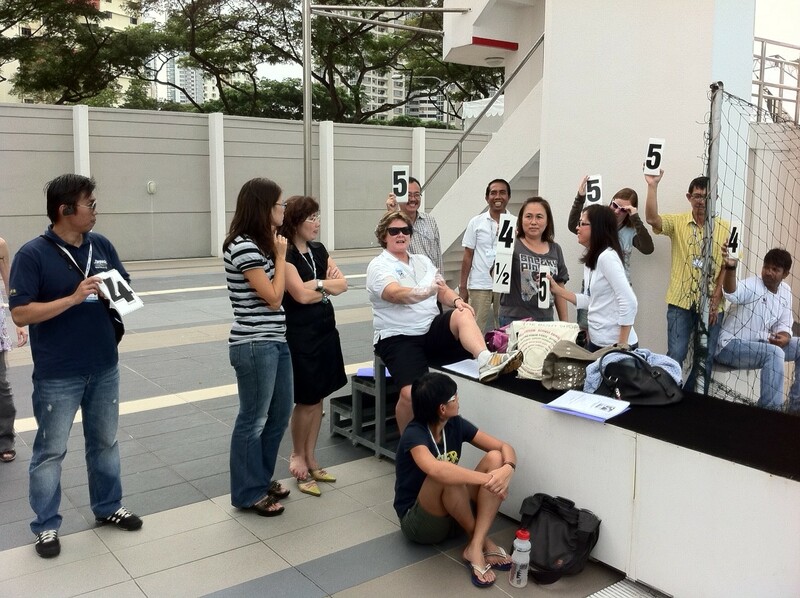 Ann taught the participants how to judge, and they had the chance to judge the divers who were training. This allowed them to experience judging, under the supervision of a qualified FINA judge and they were also able to learn from the other participants. Sue, on the other hand, explained the duties of the referee and secretariat during competitions and guided the participants in tabulating the scores for the divers. Both wireless keypads and flash cards were used, so as to get the judges familiar with the equipments that will be used during competitions. By the end of the first day, the participants had a clearer understanding of how a competition is run and they all would have had some experience at judging a dive. On day two of the course, Ann went into details about what to look out for at different stages of the dives – starting position, the approach, the take-off, the flight and the entry. The participants also learnt how to judge synchronized diving and they had video reviews where they could observe world-class divers and discuss their observations together. It was also an opportunity for them to test their judging skills and compare them to the actual scores the divers received at the respective competitions. After which, all the participants sat for both a written assignment and a video assignment to test the knowledge they have acquired over the past two days. Following that, Ann went through the answers with the class and clarified any further doubts that they had and that concluded the end of the judges development school. At the end of the whole course, it is no doubt that the success of the event have allowed participants to increase their knowledge about judging diving and for those who have had prior judging experience sure went home with new lessons learnt. ~ by Singapore Diving on January 23, 2011.